I just got a new assignment at church in our women’s organization, called Relief Society. As part of that calling, I am responsible for planning a monthly Relief Society activity. This month, we decided to have a little “getting to know you” Valentine’s Day party. The theme was “Love One Another”. Just a chance for everyone to find out more about each other, and have a little bit of fun. I put myself in charge of games. 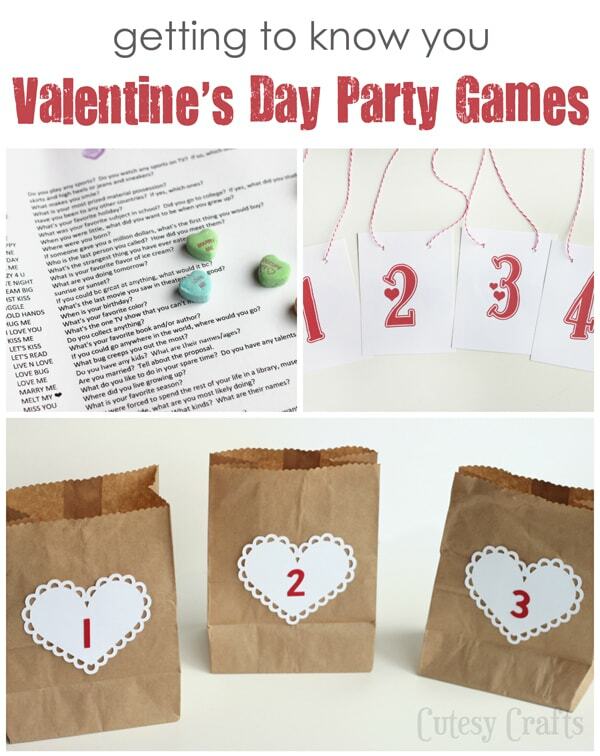 These games can be used for other Valentine’s Day parties as well though. You can even use the ideas and change the questions for your age group. 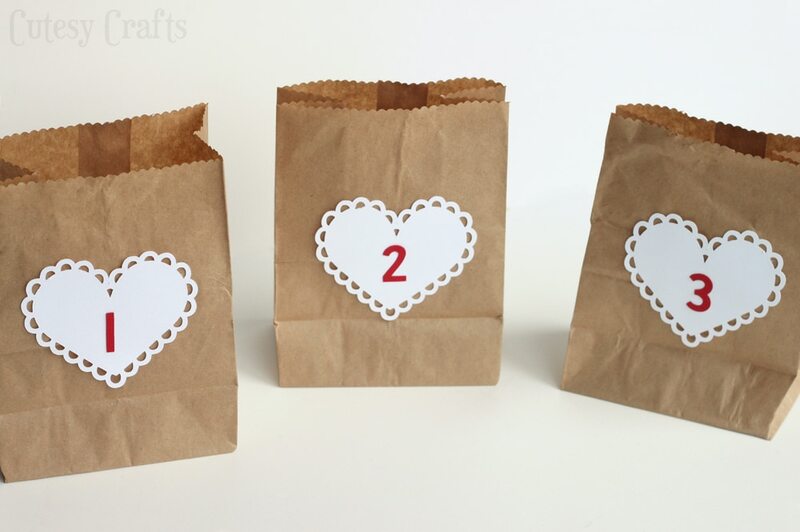 For a kid’s version of the conversation hearts game go here. Printables for all of the activities can be found here. I only made numbers up to 32, but I used the font True Stories if you want to make more. Now I just needed to take care of the problem that everyone was sitting at separate tables. Before we started the conversation heart game, I gave everyone a tag to wear around their necks. 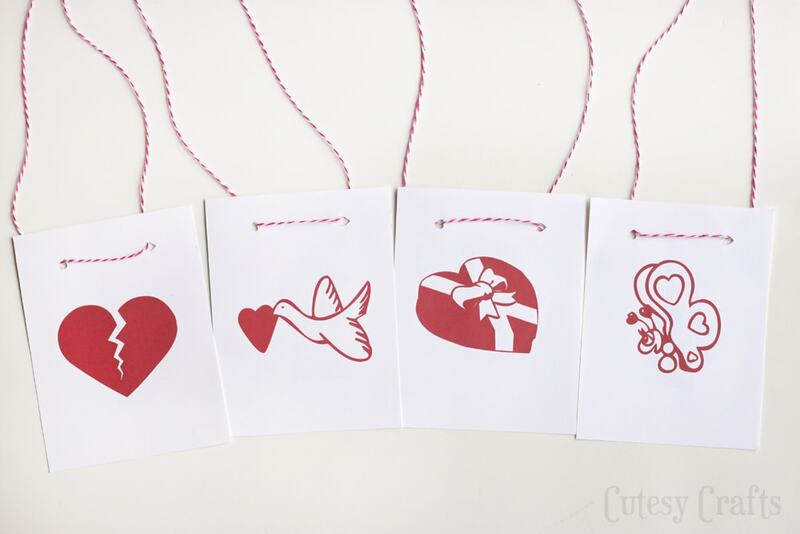 There were four kinds of tags, “heart breakers”, “lovebirds”, “sweethearts”, and “love bugs”. Make sure to alternate them when you pass them out so you don’t have a whole table of “heart breakers” or something. Explain that every couple of minutes you will be calling out a name for one type of tag. Everyone who is wearing that kind of tag has to get up and move to another table. If you call out “heart attack” everyone has to get up and move. They continue to play the conversation heart game after moving to their new table. The tags that I made were two-sided. For this last game, everyone turned their tag over to the side that had a number printed on it. Every person at the party should have a different number. I planned for 32, so there were 32 numbers. I had a mini freak out when we realized there were 38 people there, but thankfully my friend Savanna was there to whip up some extra tags for me. Thanks Savanna, you saved the day! Everyone got printouts with each of the numbers listed on them (two pages for each person). Every number on the paper represented the person in the room with the matching tag. 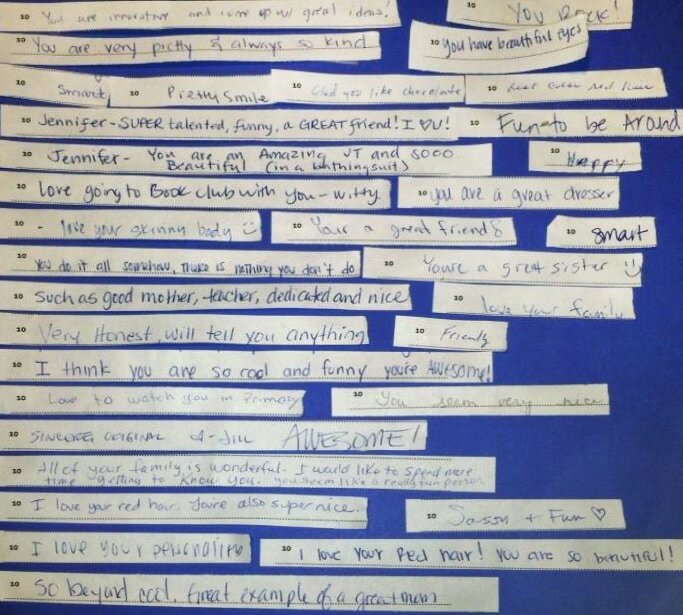 You had to go around and write one anonymous compliment about each person next to their number. It could be something simple like “I like your hair” or something more thoughtful. This was great! It got everyone out of their chairs and really figuring out who everyone was. When they were done, we cut the papers into strips and sorted them into cute bags with their corresponding numbers on them. In my head, the paper cutting went a lot faster. However, 38 people made for a lot of cutting to do, and we only had two paper cutters. If I were to do it again, I’d just pass some scissors around so everyone could cut their own sheets. Next time. For the bags: To keep things cheap, I used some scalloped scissors to cut the tops off of some brown lunch bags (I cut off about 4 inches). I used my Silhouette to cut out the hearts and numbers. I had all of them set up on a long game/dessert table. Overall, a great activity if I do say so myself! Everyone seemed to really love getting all of the compliment “Valentines” and really got to know each other better. Wish me luck in my new calling! 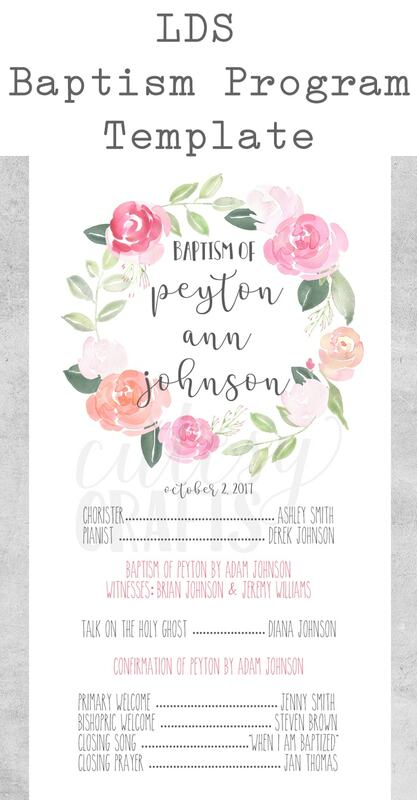 You might also like this free LDS baptism program template. I looooove this idea! And I have the same calling as you! I’m sure I’ll definitely be checking your blog for ideas. We should get together and share ideas some time. I’m struggling with good ideas. Thanks for this one. I would love to do this with our sisters! Thanks Alisha! This activity was a hit! We should totally get together to brainstorm. It’s hard to come up with things. 1. love bird 2. the sweetheart? could you email me that page and maybe I could get it to print with all 4 images as that is the front of the tags. I tried to email the file to you, but it won’t go through. 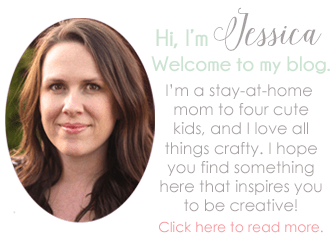 Send me an email at cutesycrafts (at) hotmail.com, and I will try again. Did you have a message that went along with it or it was just simply this activity? Iam planning on doing this activity for the sister in my YSA ward and the relief society president got onto me saying we need to tie in a message so I was courious to know if u had one at all?? Love this idea it’s super cute!!! I didn’t have a message per say, but the theme was “Love One Another”. You could go along those lines and find something to talk about for sure. My main goal was to get the sisters to mingle and go outside of the cliques and comfort zones. We are doing this activity at our church building next week. I wondered if you have the conversation hearts document in other than a pdf format? I may need to make changes to what the hearts say based on the hearts I end up purchasing. Thank you so much for all of these great ideas. I have the same question as Jessica. Is there a way to get a editable version of the conversation hearts document? I love love love this and am planning on doing this activity in February with our Relief Society. Thank you so much for sharing. 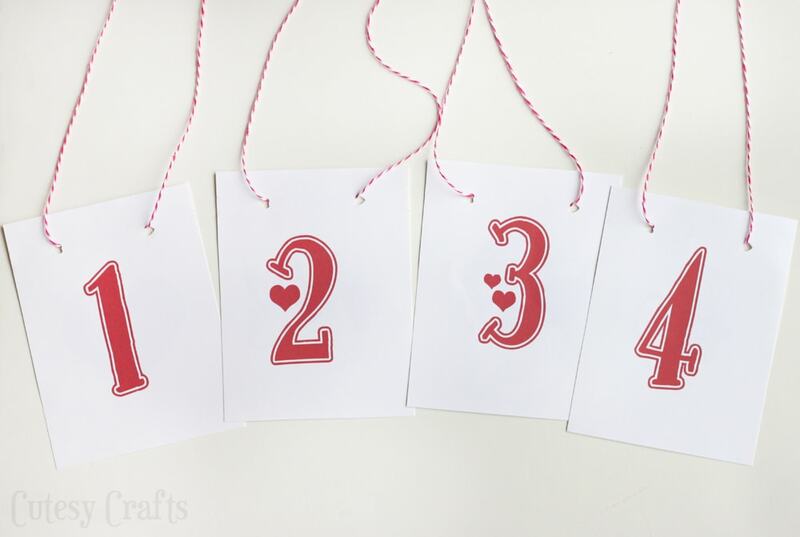 I lost the original file, but typed up another one for a kid’s version in this post: https://cutesycrafts.com/2016/02/conversation-heart-valentines-day-game.html. You will have to change it for RS, but the main parts will still be there. I will send it to you in an email. Let me know if you don’t get it. Thank you for sharing. I love these games! Your ministry is SUCH a BLESSING!!!! 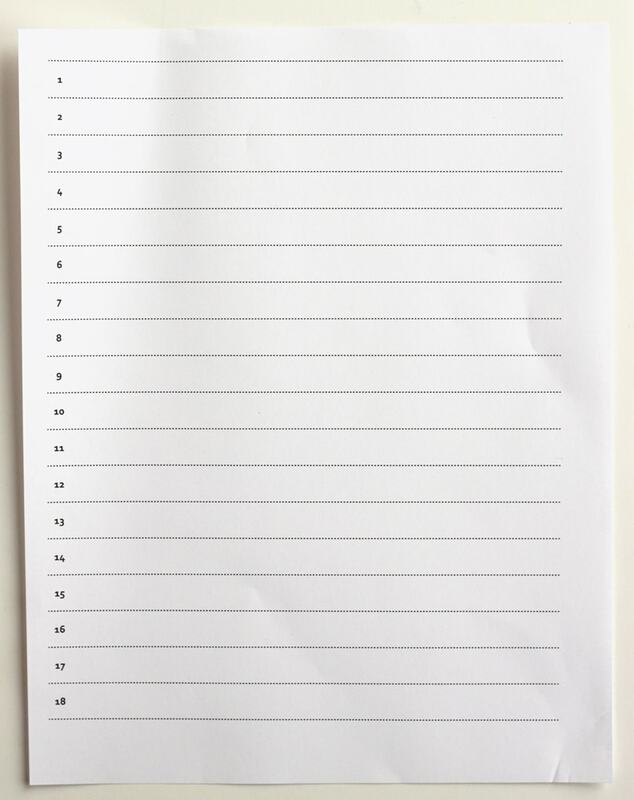 Thank you for this great idea and printables. I will be sure to use this one! You’re welcome! Glad you like the ideas!